Pupils from Duncan Forbes Primary School and Ginno Conti from Moray Firth Radio opened the new-look Scotmid in Culloden on 20 September 2013, following a complete refurbishment to improve the store for customers. 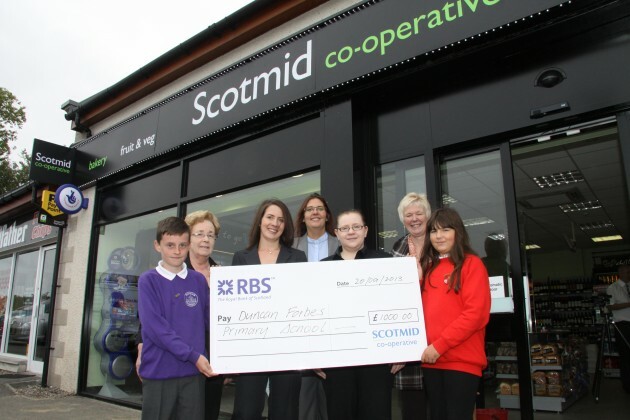 The store’s re-launch was also a chance for Scotmid Co-operative stores in the area to present the primary school with a donation for £1,000 to fund new books for the pupils. The funds have been raised through the sale of two pence carrier bags in Scotmid stores, with 100% of the profit pledged to local charities. The Culloden Scotmid store has been completely revamped with a brand new look and services for customers, including a new in-store bakery from Ashers, a local Moray Firth bakery that can trace its history back to 1877. Culloden is the first Scotmid to have an in-store bakery from Ashers and is part of the retailer’s roll-out of local bakeries in many stores. The new-look store also has a larger range of fresh fruit and vegetables, a bigger chilled section and an extended range of wine and craft beer. The store’s opening hours have been extended to 6am to 10pm, seven days a week. Scotmid Culloden is at Unit 1, Woodside Village, Westhill, Inverness, IV2 5FT and is open from 6am to 10pm seven days a week.